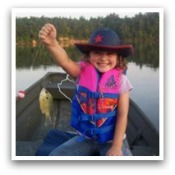 What are the key things to consider for awesome summer bluegill fishing? Where are the best hot spots and locations to catch those beautiful sunfish in any freshwater fishing body of water? How to fish for those bull slabs of bluegills in the summer time? These questions will be answered for you as we talk about their spawning and breeding habits, the best time frames, and a brief introduction leading to more information about baits, lures and the proper tackle to use. A summer time bluegill caught in the hot month July. Summer is a great season to take advantage of fishing for bluegills, redbreasts and shellcrackers. The following tips will help aide you into figuring what you should look for during the hottest days of the year. Their spawning and breeding habits play an important roll for us fishermen looking to successfully locate and catch them. Some panfish may begin spawning during the spring, barring that the conditions are right for them to do so. They begin to breed once the water temperatures reach right around 70 degrees, which usually heats to that comfort zone by June and July. Bluegills spawn any from in 2 to 15 feet of water, but most likely and more often from 2 to 6 feet. The hotter it is, then the deeper the beds will be due to lower oxygen levels. The 'gills nest up their spawning beds in creek mouths and sloughs of main rivers, lakes, reservoirs and ponds, and much prefer to build their spawning beds on sandy or gravel bottom flats. Bluegills are also actually known to spawn multiple times during the season. The ones that do spawn a second time are often found to be the larger sized bull bluegills. Those bigger bluegills may most likely be found out deeper in the water column. 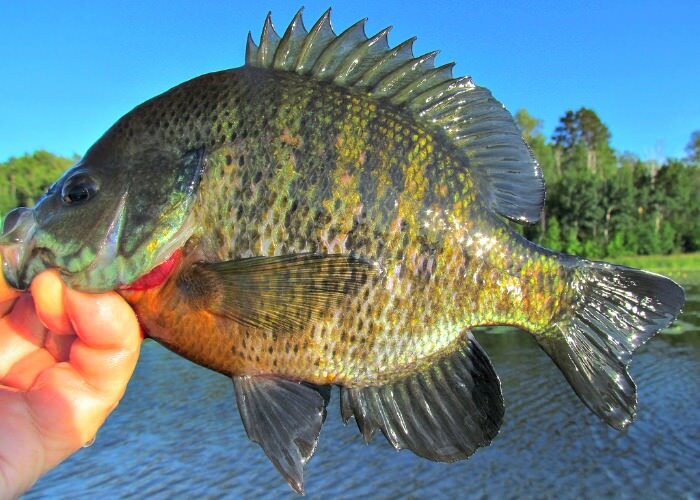 So, what does the panfish breeding habits have to do with catching bluegills in the summer? Well, now we know exactly where to find most of the bluegills, including the big bull bluegills. It's just a matter of getting out on the water to catch them suckers. Without pulling directly on top of your fishing spot, position your boat just outside of the area. I would recommend to begin working the deeper water first. The reason is because, and as with a lot of other fish, bluegills tend to head straight for deeper waters when hooked, thus spooking those other fish that might be out there. The full moon is an excellent time frame for summer bluegill fishing. Search out their beds and fish them as you normally would. During the regular daylight hours as the sun is up, fish with your favorite bluegill lures. During dusk and dawn, plug away with your top water baits. Bluegills have somewhat similar feeding habits as bass do, so bluegill fishing is sometimes referred to as a scaled down version of largemouth bass fishing tactics. Many species of fish go on a feeding binge around their spawn seasons, and bluegills are no exception to the rule. Live bluegill baits like worms, maggots, crickets or red wrigglers will most likely do the trick. And micro sized lures are just as fun and effective. Check out the information we have lined up about bluegill fishing tackle for more details and tips about bluegill fishing lures and other equipment.